Like an aristocrat, Jacqueline Lee Bouvier Kennedy Onassis had a name for every significant chapter of her life. In her best-known chapter she became the 35th First Lady of the United States, at the age of 31, and although there have been remarkable first ladies going back to Abigail Adams, Jackie Kennedy was singular. She had the breeding of an aristocrat to match all the names—even for someone whose father went by “Black Jack” Bouvier—and an insistent sense of culture and style in a fuddy-duddy American politics that cared little for either. For a first lady her beauty verged on the unseemly. Pictures of a very young Jackie suggest Elizabeth Taylor in her child-star days, albeit with a particularly steely gaze. Condemned to be the daughter of one womanizer and the wife of another, she led a life divided into halves: Her First Ladyship ended when she was 34, and Jackie 2.0—which included a book editor’s career at major New York publishing houses and another marriage, to a Greek shipping tycoon who left her widowed again—ended with her premature death two months shy of 65.
that myth isn’t Jackie herself. Rather, Jackie is the mythmaker who then would become, more than she bargained for, part of the myth she created, which itself became more than its focus, President John F. Kennedy. Jackie begins a week after she has desperately scrambled from a Lincoln convertible in a suit and pillbox hat matching the color of her husband’s brains on the backseat. Now shell-shocked, bitter, smoking furiously, she attempts to make sense, in terms both spiritual and earthly, of an assassination that has no sense, and only when the movie is over will you realize that what’s missing in the no-longer-first lady is a capacity for yearning, as the public yearns for the fallen president on her behalf. Jackie comprehends the depth of what the country feels before the country does, grasping the communal mood for canonization, for bestowing upon the new martyr the same secular sainthood that fell to another president a century earlier, when the funeral train carrying Abraham Lincoln’s body barely reached Illinois before he became the American Jesus, killed on Good Friday. As tactfully as possible, others point out to the widow that President Kennedy didn’t free slaves or win a civil war or save a republic or reinvent the essence of the National Idea (“a new birth of freedom”), but she won’t have it: Her husband isn’t going to be some James Garfield no one remembers. She weaponizes tragedy less to raise a monument than to exact revenge for what the country has done. In real life, blunt facts of history eventually weigh in. 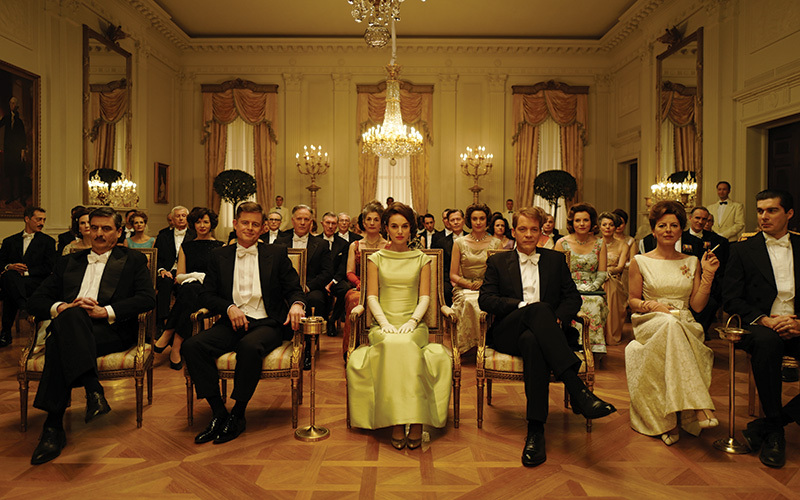 History replaces mythology with a reality more complicated than welcome even half a century later, which makes all the more striking how the myth that Jackie created of Kennedy’s presidency as King Arthur’s Camelot (then the subject of a popular Broadway play) continues to resonate. She was a Warholian before Warhol was. Amid suffering and loss, she shrewdly intuited that, in a new multimedia age, perception might yet turn truth inside out and consume those historical facts about her husband of which she was more cognizant than most: not just the serial philandering with a predatory, and almost Trumpian, creepiness but a pathology enthralled by personal doom, the ultimate irony being that the health of this most youthful and apparently “vigorous” of presidents was in nearly constant peril from Addison’s disease, thyroid problems, prostate problems, hypotension, a severely deteriorating spine, and incessant pain. Most of what we now know about President Kennedy’s first 18 months in office is alarming, and much of what we know about his last year is disillusioning, including his resistance to the landmark civil rights legislation that only the velocity of his martyrdom got through Congress. On the other side of the ledger there isn’t much other than that, oh yeah, he saved the world. We should add he had no small help in this from his Soviet counterpart, Nikita Khrushchev, when military brass on both flanks of a Cold War glowing ever hotter were intent, in October 1962, on blowing the world up. Read any relatively contemporary account of the Cuban Missile Crisis and you sigh with relief that Kennedy—instead of his two successors, Lyndon Johnson and Richard Nixon—was in the Oval Office. After his second White House autumn, when the rustle of falling leaves resembled a planetary death rattle, some part of Kennedy that we can’t fully know changed in some way we can’t fully determine, and in Jackie that’s the Kennedy whom Jackie mourns, if she truly mourns him at all—the Kennedy who wasn’t but might have been, the Kennedy whose national vision was nuke-struck by the nightmare of extinction and the prospect of redemption, to which he subsequently expressed commitment (in his “Pax Americana” speech of June 1963), regardless of whether he was zipped or unzipped, mobile or relegated to the wheelchair waiting for him at the end of a second term that never happened. Jackie isn’t a biopic but a bio-snapshot, with the biography in question not Jackie’s but that of America’s psyche, of which she gives us a tour in the same way she gave America her famous tour of the White House that was televised to enormous ratings. On a you-are-there basis, Jackie is at once irresistible and disconcerting. Details that should be niggling threaten to take you out of the picture altogether if you’re old enough to have any recollection of the Kennedys; particularly as presidential families go, their visual impact was indelible, and therefore some of those details are non sequiturs. It’s easy to understand why casting the reliably moody Peter Sarsgaard as the murdered president’s reliably moody brother seemed a good idea, but Sarsgaard’s seething at passing events feels born of extreme irritation rather than the shattered dismay that would alter and destine Robert Kennedy to his own presidential run and assassination. A White House ballroom depiction of the considerably smaller Bobby towering over his brother the president—especially when the actor cast as JFK was clearly chosen for his resemblance—is so physically absurd that weeks after seeing the movie, it may be the scene you can’t get out of your head. For most audiences all this will be incidental to Portman’s startling performance, which is generating buzz for another Oscar and which is both formidable and problematic in fascinating ways. If there are moments when she seems to be doing an impression, it’s also true there were moments (such as the televised White House tour) when Jackie Kennedy seemed to be doing an impression of herself. Portman isn’t so much a meta-Jackie as Jackie herself was a meta-Jackie, a self-study in the private art of public image and how to embody the zeitgeist at its grandest and most glamorous. A week into her widowhood she only begins to contemplate exactly for whom or what she laments. The Jackie Kennedy of Jackie is flung into exile, into a state of vanishing more than desolation. She is consigned by the secrets of her marriage and the secrets of her country to a grief without sorrow and to a future that, whenever it could, forbade and precluded secrets of her own. Previous articleChef Ryan Ososky of The Church Key Shares His 10 Favorite Dishes in L.A.